"Panem today, Panem tomorrow, Panem forever." Summer still has about two months left, and then it's right into fall, where the latter of the season will see the release of The Hunger Games: Mockingjay - Part I, the first in the two-part finale of Lionsgate's sci-fi franchise starring Jennifer Lawrence. We just took a glimpse at some propaganda posters paying tribute to some of the real working heroes of the districts, but now we get something really juicy. 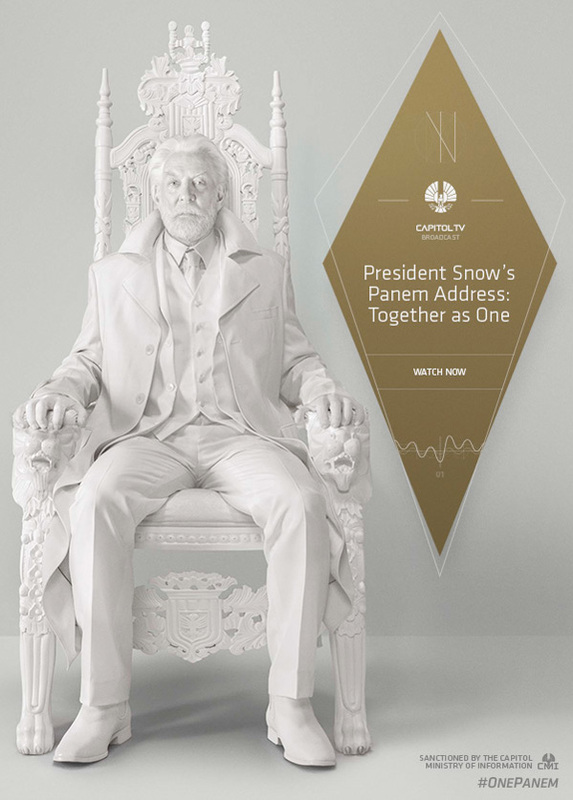 Capitol TV has just revealed an address from President Snow (Donald Sutherland) that seems peaceful, but then turns dark as he threatens the revolution rising after the events in Catching Fire. And just wait until you see who's standing right at his side. Watch now! The Hunger Games: Mockingjay - Part I is the first movie in the two-part finale of The Hunger Games franchise, based on the books by Suzanne Collins. In this chapter we follow heroine Katniss Everdeen's (Jennifer Lawrence) journey as she leads the districts of Panem in a rebellion against the tyrannical and corrupt Capitol. As the war that will determine the fate of Panem escalates, Katniss must decipher for herself who she can trust and what needs to be done, with everything she cares for in the balance. Francise Lawrence directs the adaptation written by Danny Strong and Lionsgate releases the film November 21st.